If you consider the nutritional facts of star fruit, you'll see that it can be a healthy addition to a balanced diet. Before tossing a few star fruit into your grocery-store cart, take some time to learn more about its nutritional facts and characteristics. The star fruit is the fruit of the Averrhoa carambola tree, and it's also known as the carambola. The tree is native to eastern countries such as Sri Lanka, the Philippines, and Indonesia, but is cultivated in many parts of the world, including South America and parts of the United States, like Florida and Hawaii. Star fruits get their name from their unique shape. When cut cross-wise, the pieces resemble stars. The fruit is ripe when it turns from green to yellow with brown tips. Star fruit is firm, juicy, and tastes tart, much like an apple, but with a twist of citrus. All parts of the fruit are edible, though some people still choose to peel the fruit, as its skin is somewhat waxy. Others choose to cut off only the brown tips, which can be bitter. Below are a few nutritional facts of star fruit. All statistics are based on a raw medium-sized star fruit, about three to four inches long. Calories - Star fruit contain very few calories as compared to other popular fruits, like bananas and apples. A medium star fruit eaten raw has only about 30 calories in total. Carbohydrates - A star fruit contains only about six grams of carbohydrates, which makes it an excellent fruit to include even on low-carb diets. Sugars - All fruit contains sugar, and star fruit is no exception. However, it has only about four grams of sugar per fruit. Fat - Star fruit is a fat-free food. Protein - Most fruits contain very little protein. There is only one gram of protein in a star fruit. A small percentage of fruits, including grapefruit and pineapple, can inhibit the effectiveness of certain medicines. Star fruit is one such fruit. 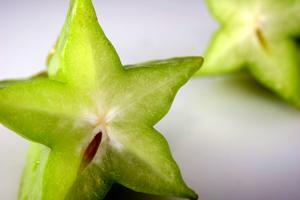 Those taking medicines for certain cardiovascular illnesses may not be able to consume star fruit safely. Additionally, individuals with kidney disease may want to avoid star fruit, as it contains oxalic acid, considered harmful and sometimes even fatal for people suffering from kidney problems. It's always a good idea to check with your doctor about any foods that might interact with medical conditions or prescription drugs. Star fruits are a unique and complex food that can provide a tasty option to your typical fruit fare. Because they are somewhat uncommon, look for them in specialty grocery stores in many parts of the country. Those in tropical climates may also be able to purchase the fruits at farmers' markets local grocery stores.